A cairn commemorates the campsite of Major Mitchell's party who camped here in 1836. Mitchell left George Stapylton in charge while he travelled on to Sydney. 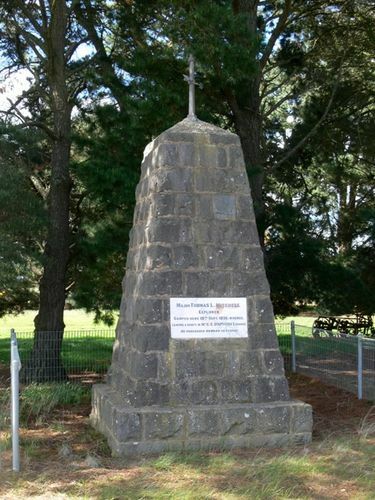 At the unveiling of the Bulla memorial for Hume and Hovell, Charles Daley the Secretary of the Victorian Historical Society suggested that the idea be extended to other explorers and a committee was formed to mark out the routes of Charles Sturt, Thomas Mitchell, Angus McMillan, and Count Paul de Strzelecki. 36 cairns or tablets to Mitchell were erected. HAMILTON, Friday.-Cairns erected by local residents under the supervision of the Historical Society of Victoria, commemorating the stages in Major Mitchell`s historic journey of 1836, were unveiled today by Sir J. Barrett. Cairns mark the camps and places the explorer passed when he opened up the inland parts of Western Victoria. The first to be unveiled was that marking the camp at Lake Repose, on the Brie Brie lane between Dunkeld and Glenthompson, where Major Mitchell rested cattle for a fortnight. An inspection was made today of the stump of a tree that was inscribed by the party. Portion of the tree is now in Hamilton Botanic Gardens. In the afternoon cairns were unveiled on the Coleraine-Harrow road, about four miles from Harrow, near the Balmoral turn off, and at Harrow, where Major Mitchell, passed at the end of July and the beginning of August. On Saturday a further cairn will be unveiled at Miga Lake, which Major Mitchell passed on 26th July. He Proceeded Onward To Sydney.